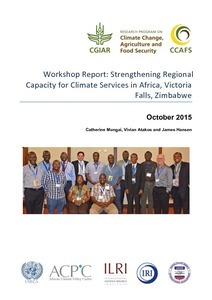 Strengthening regional capacity for climate services in Africa, Victoria Falls, Zimbabwe, 27 October 2015. CCAFS (through the International Livestock Research Institute and the International Research Institute for Climate and Society) and the Africa Climate Policy Center sponsored a workshop on ‘Strengthening Regional Capacity for Climate Services in Africa’, held on 27th October 2015 at Victoria Falls, Zimbabwe. The workshop, which was associated with and reported to the fifth conference on Climate Change and Development in Africa (CCDA-V), aimed to initiate a collaborative effort to strengthen capacity, through African regional institutions, to support smallholder farmers with relevant climate services. The workshop brought together 17 participants including scientists and technical experts to learn from and build on examples of good practice in farmer-focused climate information and advisory services, and to share elements of good practice in food security contingency planning. Discussions highlighted two key constraints to achieving the potential benefits of climate services for smallholder farming and pastoralist communities across Africa. The first is limited capacity to produce relevant climate information that is tailored to the needs of farmers, at a scale that is relevant to farm decision-making. The second is limited capacity to communicate climate-related information effectively, in a manner that farmers can incorporate into their decision-making. Organizations present at the workshop offer several promising innovations that have potential to overcome some of the critical gaps in the production and communication of climate-related information for farmers. Gaps in capacity to produce farmer-relevant climate information are closely linked to gaps in capacity to work with farming communities to communicate the information effectively and support its use. Financial investments and capacity-development efforts should address these gaps in parallel. National meteorological and hydrological services (NMHS) have the mandate to produce weather and climate information; but institutions in the agriculture sector are generally better positioned to translate raw climate information into decision-relevant information and advisories, and to communicate that information with farmers. If climate services are to work for farmers, they must therefore be developed and implemented jointly by NMHS and agricultural technical institutions. This may require new institutional arrangements at the national level. Regional institutions, such as African Climate Policy Center (ACPC), IGAD Climate Prediction and Applications Center (ICPAC) and AGRHYMET Regional Center, are well positioned to assist national governments to strengthen climate services that can benefit smallholder farmers – at scale. The workshop provided an opportunity to advance discussions about collaboration toward strengthening climate services for agriculture in Africa, through regional organizations and processes. Mungai C, Atakos V, Hansen J. 2015. Strengthening regional capacity for climate services in Africa, Victoria Falls, Zimbabwe, 27 October 2015. CCAFS Workshop Report. Copenhagen, Denmark: CGIAR Research Program on Climate Change, Agriculture and Food Security (CCAFS).